I do like making a veggie stir fry. They are a classic dish and easy to make. But I am always a little disappointed that they don’t taste more like they do in the restaurant. This recipe was on of my best yet, and did taste like it was from a restaurant. Definitely plan to make it again. 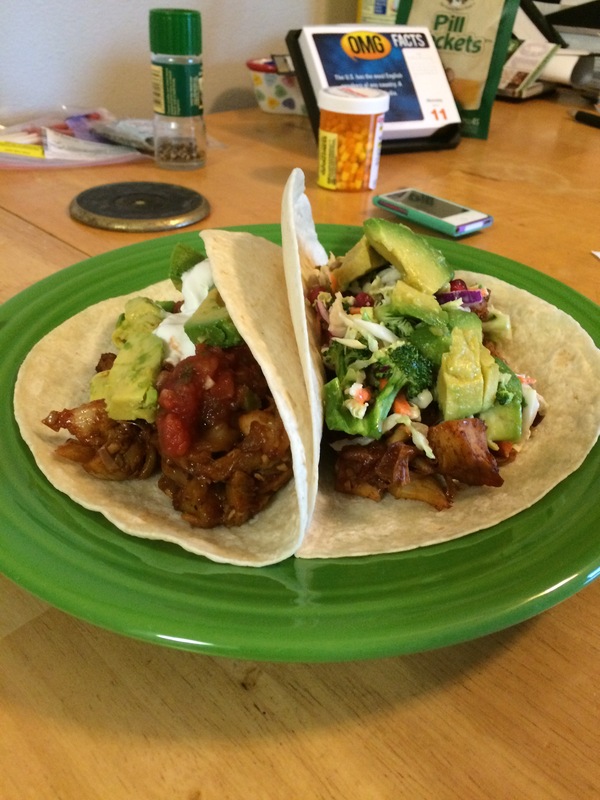 The other day I showed you my jackfruit tacos. I made a broccoli slaw to top the tacos. I had a lot of it leftover, so converted it in to wraps the next day that I brought and shared at work. I have seen pictures on various blogs for ages now using jackfruit as this new alternative to pulled pork. I made the mistake of buying a full jackfruit from the store, but failed at being able to cook that. Then I found most recipes called for getting canned (as long as it is in water or brine, NOT syrup). I got two cans of it from the local Asian store and was SUPER thrilled with the turn out. This recipe was just filling and mouth watering. I got the recipe from Minimalist Baker. 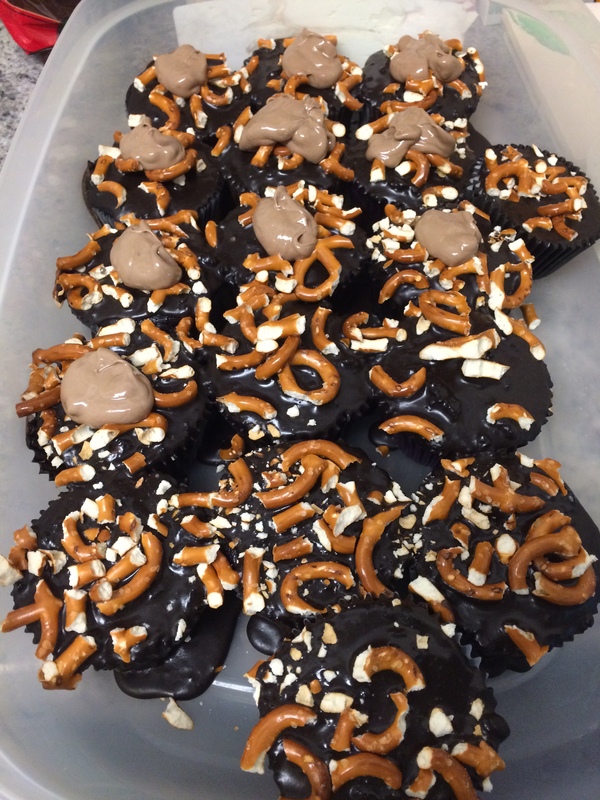 Sorry friends, no recipe here, but wanted to share the picture of these delicious and super sweet chocolate pretzel cupcakes I made. The ones with the brown on them have a caramel topping, but that didn’t work out as well as I would have liked (the vegan version was super hard instead of chewy). I liked them but am not going to make them again so no recipe today. These two recipes were super fun for me. You see, my boyfriend the Veganaut is also a vegan, but growing up one of his comfort foods was twice baked potatoes. He has tried to replicate them a couple times and been unhappy with the result, so I agreed to try my hand at a couple different versions. While it was not what he remembered as a child, it was certainly delicious, and we will be fine tuning the recipe in the future. Sometimes slow cooker meals are the best, especially when it means you can get all your other daily errands down, save time on cooking in the evening, and you get to enjoy the aromas throughout your place during the day. I did my usual with using some leftover ingredients here. The combination was amazing! 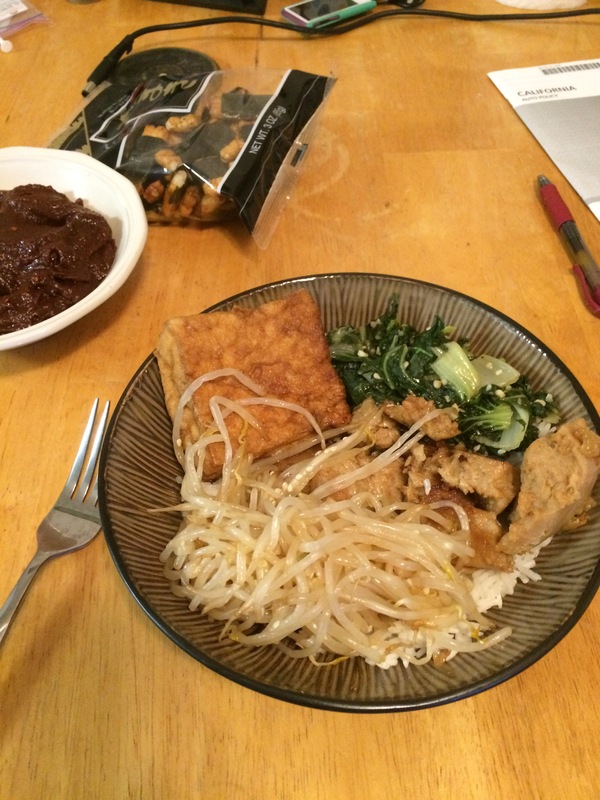 Today’s recipe comes entirely from Fat Free Vegan, but I had to share the wonderful picture. Time for me to try some Korean restaurants!